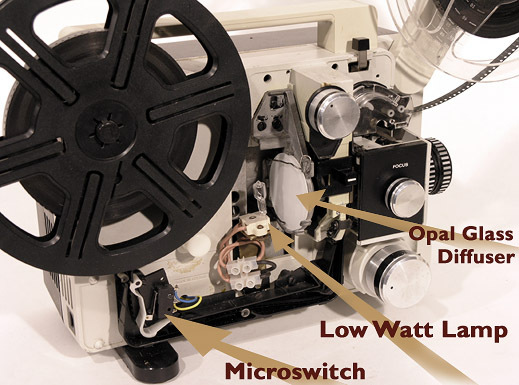 Modified Eumig projector showing addition of microswitch trigger, opal glass, and low-wattage lamp. The dual gate apertures of this projector has also been modified to show the 'full frame' gate area of the film, both for Standard 8mm aperture, and also for Super 8mm aperture. The transfer method is projection of the film onto a plano-convex lens to achieve an 'aerial' image. The camera is set up and focussed in the exact position to shoot the aerial image which appears as if floating in space. www.Ian-Partridge.Com ~ Web page content photography and design ~ Copyright ©2009 Ian Partridge.